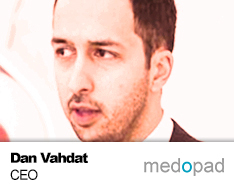 Dan Vahdat is co-founder of Medopad, a British healthcare technology company enabling connected care. KPMG recently named Medopad a $1B company in the making. Dan is an award winning innovator in the fields of science and technology. His professional career spans from IT to medical technology including several years at Johns Hopkins in the US. Dan studied Engineering and Mathematics, after which he pursued his PhD in Bio-Engineering at Johns Hopkins and Oxford University.